Save me from myself. 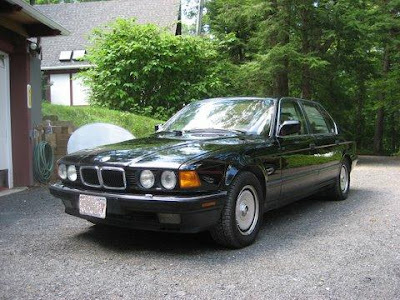 My friend Jeff is selling his 1989 BMW 750iL. He's been talking about doing it for a year or so, but couldn't bear to part with it. Now he's serious. I've lusted after this car for as long as he's owned it. I want to own it. When new, this car sold for over $70,000.00. In 2009, with dollars adjusted for inflation, this car would be pushing $100,000.00+. Not a lightweight car, it is still able to reach 60 MPH in 7.4 seconds. It featured every possible convenience and comfort feature you could imagine in 1989. Jeff's car has 214,000 miles on it (maybe a few more as he's is still driving it). It's starting to show its age. There is a bit of rust on the door bottoms, the headliner is starting to droop and two cracks recently appeared in the dash. It's not a show car, but a really fun driver. Mechanically, what can I say? Jeff is, without a doubt, the best foreign car mechanic I've ever met. He's treated this car the same way he's treated his Ferrari, BMW 5 Series and Land Rover. Preventive maintenance is his thing. (Which often gets us into a few arguments when he works on my cars... Me: "Jeff! It's not broken, why replace it?" Jeff: "It's going to break sometime, we might as well replace it now.") The oil and filter have been changed every 3,000 miles and Jeff has a spreadsheet showing every repair he's done (Of course he does - he has a spread sheet on every car he's worked on, including mine, friends of mine - cars he may have only seen once or twice - and, of course, customer's cars.) and a folder of every receipt for every part. The car had around 130,000 miles on it when Jeff bought it. The amount of work and parts he's put into it (including replacing the troublesome and expensive transmission) is mind boggling. The car uses about a quart of oil every 1000 miles or so, which is not too bad for a car with 214,000 miles on it. The A/C needs a charge, which Jeff is doing this weekend. Other than that, there's nothing wrong with this car. Jeff claims he can get 20MPG on the highway and 13 or 14 MPG around town. I never hit those numbers when I drove it, but I wasn't exactly driving it gingerly. So, here's the reality of this car. It has 214,000 miles on it. It won't last forever, but there's still plenty of life left it it. I can't think of another V12 that you can buy for $3500.00 (A ratty Jaguar XJS, maybe, but old Jags, while fun, are not as well built as a BMW). I also seriously doubt you'll ever be able to find a another relatively inexpensive V12 BMW that has been better maintained than this one. E-mail me if you're interested in this car and I'll put you in touch with Jeff. If you buy this or any E32 BMW, check out Johan & Sean's E32 Page. It has tons of information regarding repair and maintenance of the 7 Series. Yes, this is a friend's car, but Jeff did not ask me to write this post. The other night, over big drinks and tiny hotdogs at a place called Teo's in Pittsfield, MA, Jeff mentioned that he was finally serious about selling it. I asked him if I could write about it prior to him putting it on Craigslist or eBay. I thought it would be cool to use this car, one I'm very familiar with and really like, as my first "exclusive". If Jeff had decided to sell this car two years ago, when the economy and the music industry were doing better, it would be in my driveway today and I'd have written a post at some point about my BMW 750iL. As it is, I'm still very, very, tempted to buy this car. makes as it drops down a gear and rockets to license loosing speeds.